To stimulate and advance public interest in, and care for, the beauty, history, character and well-being of Linlithgow and district, the maximum extent of its area of concern being defined by all postcode units within the postcode district of ‘EH49’. To encourage and advance high standards of architecture and town planning, including the adequate provision and protection of green spaces, in Linlithgow and district, this to be achieved by such means as scrutiny and constructive comment on planning applications, proposed developments and planning policies and the advocacy of alternative sustainable approaches to the planning and development of the town. To pursue the above ends by means of meetings, exhibitions, lectures, conferences, publications, products, publicity, events, collaboration, lobbying and participation with other organisations including schools and committees, and the promotion of schemes or any other activities of a charitable nature. To undertake, and encourage others to undertake, sustainable practical and physical works to preserve, sustain and enhance the beauty and character of Linlithgow and district, including, amongst other things, the creation of heritage trails, the installation of public art and the clearance and upgrading of untidy areas. Linlithgow Civic Trust is involved in many projects. 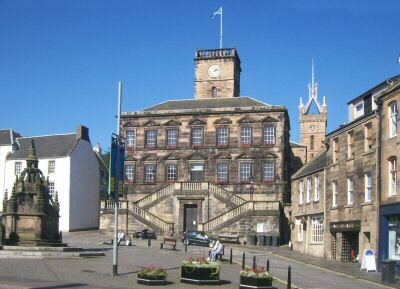 It is part of Linlithgow Planning Forum and Linlithgow and Linlithgow Bridge Town Management Group. Click on the links below for more details. Programme: Linlithgow Civic Trust (LCT) organises a programme of outings and talks. Planning: LCT is part of the Linlithgow Planning Forum and reviews plans for development in Linlithgow and the surrounding area, making constructive comments and objecting to proposals deemed unsuitable. Publications: LCT has published a number of items that can be purchased locally. Perambulation of Linlithgow's Marches: LCT organises the annual Perambulation of Linlithgow's Marches, which takes place each year on the Wednesday before Linlithgow Marches Day. Doors Open Days: LCT plans and organises West Lothian Doors Open Days, which takes place in September. A number of buildings that are not normally open to the public can be visited during a weekend. Over the years we have contributed in a number of areas. See the Achievements page for details. If you'd like to support Linlithgow Civic Trust, click here to become a member of Linlithgow Burgh Trust - or you can make a donation on-line by clicking the button below. Your payment will be routed through PayPal by credit card, debit card or using a PayPal account. There is no need to become a member of PayPal - just select "Continue" under the "Don't have a PayPal account" heading.